For the record, I also wrote the foreword for Olivier Blanchard’s book, Social Media ROI in early 2011. Yes…same name. I’m not a supporter of the fact that the publisher of this latest book did not take Olivier’s title into account. But for the purpose of this post, I’d like to focus on the evolution off the topic. In Olivier’s book, I concentrated on the disconnect in POVs between executives and social strategies, where ROI for all intents and purposes represents Return on Ignorance. His book makes a compelling case for convincing the c-suite and also empowers social strategists to design meaningful ROI initiatives. In Vincenzo’s book, I look at ROI through a different lens, exploring its relationship to influence. It’s a complementary approach and here, a bit more theoretical as I try to raise the bar for strategies overall. In the book Engage, I introduced a metric that tracked Return on Influence. Here, I wanted to expand on the methodology of that metric to better define the relationship between cause and effect and the role you play in it. Thus, ROI in this context becomes the Realization of Influence. The idea was to raise the stakes in the equation, to design desired actions and conversion into our strategies so that ROI measured real change, outcomes, and the progress of transformation. While similar, it’s a subtle nuance that’s powerful. In the development of new ROI strategies, the result is a truly a measurement of influence. No, it’s not a score. It’s a metric of cause and effect. As such, you become an architect of influence as you define the change or actions you wish to see. In the strategies that you develop over time as by definition, you introduce initiatives that cause effect or change behavior and you can measure it. While you still calculate return on investment, you are also measuring the realization of influence. And, it’s far more accurate than a traditional influence score. In social media, one of the most often asked questions is what’s the ROI? Surprisingly, this question is voiced without an understanding of why it’s asked in the first place. If the answer is “I don’t know,” it makes it a simple and grounded decision to either minimally invest in social media pilot programs or not invest in any new media efforts whatsoever. If the answer is, “this is the ROI we can expect from the following initiatives,” you’ll witness an incredible transformation of doubt or skepticism into curiosity and eagerness. The reality is that no matter how creative the idea or however brilliant the strategy, it is the responsibility of decision makers to evaluate proposals based on merit, thoughtfulness and impact to the organization. People, time, capital, technology, are finite resources. It really comes down to opportunity costs. If the organization invests in new media initially, it either must “create” new resources and funds or it must borrow from elsewhere. For you to realize your vision and to bring your plan to life, you must tie everything to Business objectives and priorities or demonstrate how your strategy will push the organization forward. It comes down to numbers and core values. Will your ideas perform against or exceed existing business metrics and KPIs? And, do they align with or improve the values of the organization and the universal aspiration for building customer relationships. Performance metrics are a key part in measuring progress and communicating whether or not you’re on plan. They also force us to think through strategies at the beginning of the process, so that initiatives unfold as designed or intended. In many ways, performance metrics are a subset of influence. And, influence is an underestimated or misunderstood business purpose. Influence is the ability to cause effect or change behavior. And as you think about ROI, think beyond numbers. Become an architect of relevance where cause and effect become the foundation for how you build the business of the future. Developing strategies where cause and effect are the catalysts for performance inspires strategies rooted in significance whereas metrics and KPIs document real transformation. 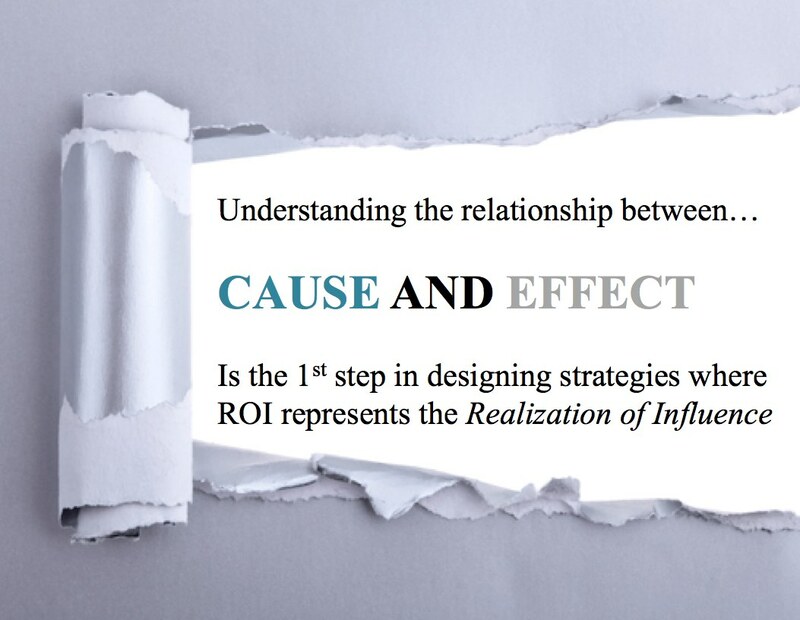 I like to think about ROI in this regard as Realization of Influence…tracking the relationship between cause and effect or the change in behavior. As such, packaging raw numbers requires deeper consideration to demonstrate progress toward business objectives and priorities. 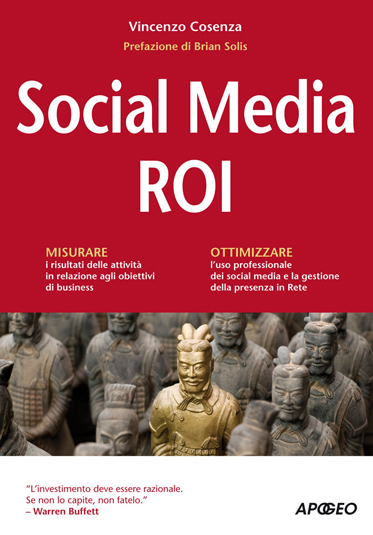 Vincenzo Cosenza’s Social Media ROI is now available online, in ebook format, and also in bookstores across Italy. Wait… Another guy wrote a book titled “Social Media ROI,” and… you wrote his foreword as well? When ROI stands for Repudiation Of Integrity. This is stinky in every way! How bad can you get? So, obvious question: what’s the ROI (investment) on the ROI (influence)? The (I) investment is the time, resources, and technology used to introduce and manage a strategy that is focused on the effect you wish to cause. The (R) return is the effect or the extent of the effect or the value of the change in behavior you set out to cause. Part of the difficulty of measuring ROI today in social media is that (R) is not thought through nor its relationship to (I). I believe that the relationship between cause and effect is instrumental in communicating traditional return, but it starts with intention and purpose. It would change the landscape for almost all social media strategies…for the better. More and more, people who work in any form of a marketing arm of a company, including evangelists, are seeing “influence” move up the stack as a primary metric that we are ranked on. The impact we have through blogs, tweets, and other forms of social media have long been a means of aplifying a message. Now it is being looked at more deeply from the perspective of who amplifies the message. There is more Longer Term ROI that is being looked at vs “that tweet was retweeted by a bunch of random people 1000 times”. The simple chart you have at the end of the post is exactly what I am seeing in my own role. A movement from the raw numbers toward the change those numbers drive. I’m not sure why a “social media influencer” would say “F… ROI” in such a public forum. That’s an unfortunate statement to make as it sends the wrong message to strategists. Yes…it’s difficult. But exploring ROI doesn’t take away from the importance of engagement and relationships. However, beginning with the end in mind and measuring each step can only help everyone involved. I completely agree with this. If people are involved with you on an emotional level, they will be much more likely to refer friends and family to your business, as well as talk positively about your brand. Awesome post. One raw number that is althought missing from your list is the link building factor. Engage socially, share meaningful content and you will assuredly receive links and mentions, which in turn can help your organic rankings, and of course improve on your online objectives. 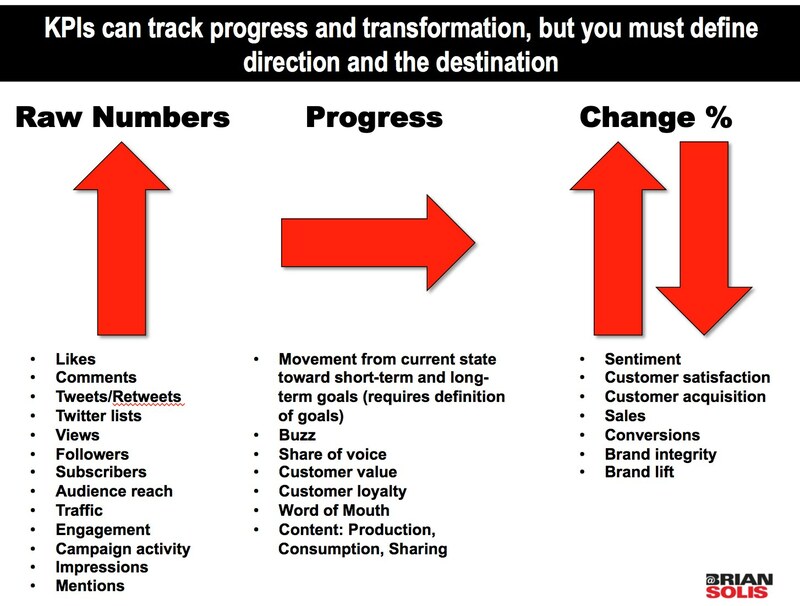 great representation of how social media progress can be tracked.